Member Kathrin Luddecke highlights the benefits of attending the SfEP Oxford local group and the value of being able to ‘try before you buy’. When I was thinking about proofreading, and possibly copy-editing, as a career option, I started – as one does these days – with an internet search. Up popped the Society for Editors and Proofreaders’ website, including a very useful ‘Test yourself’ feature for anyone who, like me, fancies themselves as a potential ‘pro’. Reassured by a decent result, while also giving me an idea that of course there was room for improvement (and a hint at the usefulness of specialisms! ), I decided to look into the option further. I found a number of helpful guides on the SfEP site, but I was particularly interested in a chance to find out more about what editing is actually like from people already in the profession. 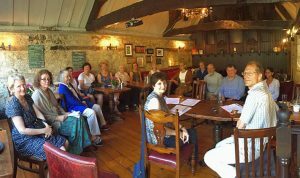 So it was great news to come across the SfEP’s ‘Networking’ section – and even better to find out that there are local groups, run by members on a voluntary basis, across the UK and indeed further afield. As a (potential) ‘newbie’, it was brilliant to read that I could go to up to three meetings before deciding if the career, and membership of the Society, was for me. It can be a bit daunting, of course, to go along to a meeting of what is a group of complete strangers. 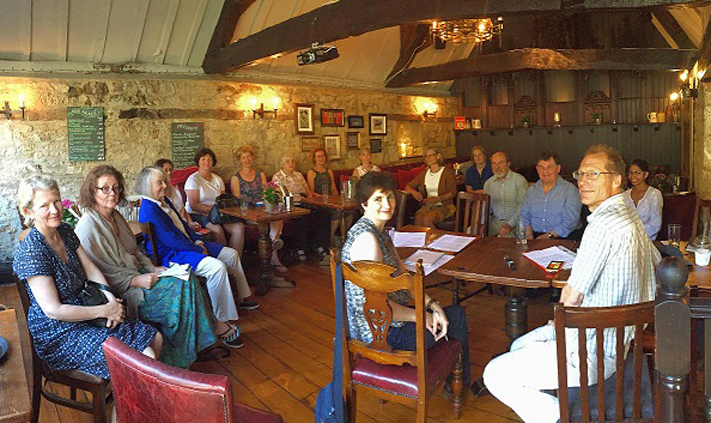 Luckily, I quite enjoy getting to know new people, so I set out to say hello to members of the Oxford Group. Again, it was really easy to contact the volunteer coordinator (at that time, Robert Bullard) through the information on the Group’s page, just to check it would be okay for me to come. He kindly said yes, and off I went to the Kings Arms. Meetings of our group are on a weekday morning, rotating through the week, to suit different working patterns and other commitments people may have. It seems to work well for Oxford members, as I found a room full of a dozen or so people, with a nice buzz. Over our drinks – as a group, we seem to have a predilection for cappuccinos – introductions were made. Of course I couldn’t remember everyone’s names (I do now! ), but I felt immediately at home, among people who cared about spelling, grammar, choice of words, and who were friendly and welcoming to boot. Then the business commenced, looking at identifying priorities for training to be put on for us freelancers with the support of the Oxfordshire Publishing Group. It all sounded very exciting and it was great to find the local SfEP group linked into wider publishing networks. I also found it terribly useful to hear about the different areas in which people were working – a lot of academic publishing (this being Oxford), but also educational and more business-oriented. Quite a few people had been in the profession for a long time and were clearly very busy and in demand, while others were new and still looking for work. After that initial get-together, I went to one more meeting, starting to remember names as well as faces, then made up my mind to go ahead and join the Society. I knew by that time that I had much more to learn to become a professional proofreader and then, perhaps, editor, so signed up for the SfEP’s ‘Proofreading Progress’ course – having made sure this was the right level for me to start at. It wasn’t as easy as I had secretly hoped, but that meant I was properly challenged and learned lots! While taking the course was excellent and really helped me develop best practice, learning about mark-up and more, it was the friendly exchanges with others in the local group, the chance to swap experiences, ask questions and share frustrations (especially with trying to find a way onto publishers’ freelance lists, which can take some time, and tests, of course) that made all the difference to me wanting to keep going. There’s nothing quite like mutual support! To me, being a member of our local group is one of the best things about the Society for Editors and Proofreaders. I feel that even more strongly having spent just over a year acting as the Oxford group’s lead coordinator, supported by Sally Rigg and Piers Cardon. It was not too difficult a job, with others helping to put together a series of training and more informal networking sessions over the year – from an accountant to marking up PDFs, from editing in Word to marketing. Luckily, with all the support, I had enough time left both to start taking on work and to get into editing, starting with the SfEP’s ‘Copy-editing Progress’ course. And while I have just handed over the lead coordinator’s role for the Oxford Group to Lesley Wyldbore, I will definitely keep going to our meetings! I can thoroughly recommend getting to know, and helping out with, your local group, wherever you are. In between meetings, the SfEP’s online local group forum is a great way to keep in touch, continue conversations and stay up to date with what’s up. 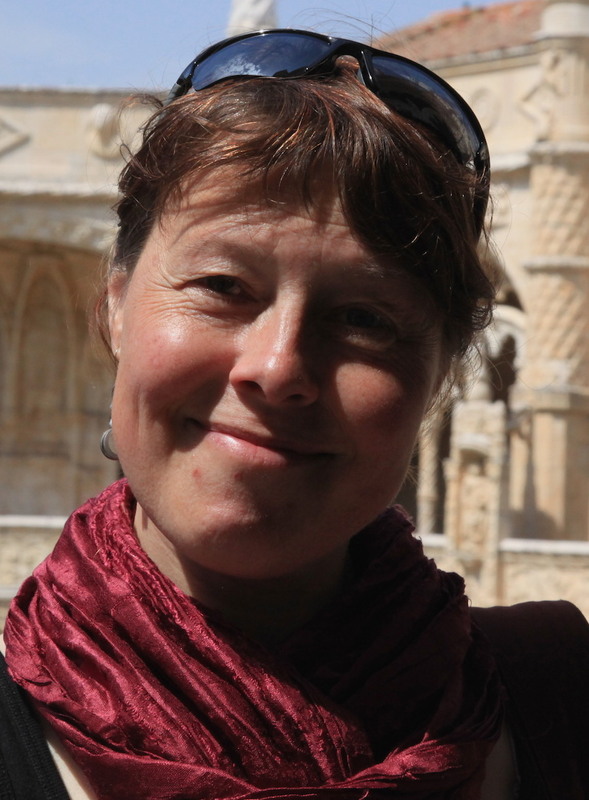 Kathrin Luddecke has a background in Classics, a passion for translating and editing and a love of art. 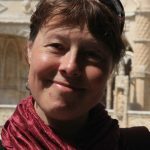 She has lived, studied and worked in Oxford for half her life and is enjoying the freedoms – and challenges – of having gone freelance in 2014. Find out more on Kat’s (rather intermittent!) blog or follow her on @KathrinLuddecke. This entry was posted in Local groups, SfEP membership and tagged community, copy-editing, local groups, Oxford, proofreading, SfEP, Society for Editors and Proofreaders on December 15, 2016 by Abi Saffrey.